At Avas Flowers, we are known for our fresh flowers and creative floral arrangements and bouquets; however, we know that flowers aren’t for everyone. For that reason, we also have a selection of green plants that are available here on our site. While some of our plants may bloom seasonally, they are more conservative than our flower arrangements and are natural in appearance. When given one of our indoor green plants, the recipient has an enduring keepsake that will remind them of your kindness, well wishes, and thoughtfulness for years. When you buy a floral bouquet, the flowers are cut and will eventually need to be disposed of. 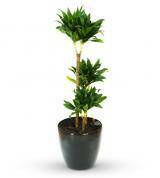 For people who prefer live plants, our green plants make a great alternative. When people order plants online from Ava Flowers, they are buying plants that are hearty and healthy. Because they are alive, they will be around for years to come, provided they receive the proper amount of sunlight or shade, are watered correctly, and are otherwise properly cared for. This makes them a wonderful gift for eco-friendly individuals and for people who enjoy caring for plants. Our potted indoor plants may even be re-potted in the future to encourage growth. Indoor green plants also make great gifts for people who are typically allergic to cut flowers or for people who may not fully appreciate the colorful beauty of a flower arrangement. A plant also makes for a good housewarming gift whether moving into a new home, apartment, or dorm room. 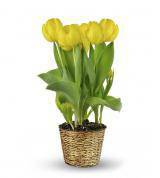 A verdant and healthy plant also makes a thoughtful gift for someone who is ill or feeling under the weather. 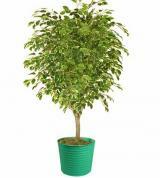 The plants sold on our site vary in type and size. Although our available inventory does not remain static, we may carry plants such as a potted corn plant, ficus tree, or smaller bonsai tree. We also offer dish gardens that are made of a variety of plants and are often placed in an attractive basket. When you purchase premium quality flowers and/or plants from Avas Flowers, you can easily arrange for plant and/or flower delivery to most locations nationwide. Depending on where you plan to send your plant gift, it may be delivered same day, or the day after the order is placed. As a customer, you’ll receive our Avas Flowers satisfaction commitment. This commitment allows you to notify us within seven days if you are not satisfied to get another product or a refund. Items can be purchased at any time, day or night, when ordered online. Another option is to order flowers over the phone. If you have any questions about your arrangement after having placed your order, contact us; our customer service representatives are here to answer your questions 24 hours a day.